Bausch & Lomb are global leaders in the eye care industry. The group manufactures high-quality eye care products, including some of the most recognisable contact lens and vision care brands. Bestsellers include SofLens, Biotrue and PureVision contact lenses and the ReNu MPS cleaning solution. Trusted by millions of contact lens wearers across the world, Bausch & Lomb provides a wide range of products including daily, monthly and two weekly lenses as well as coloured contact lenses in a range of natural shades. The company also provides multifocal and toric lenses for those with astigmatism or presbyopia. Bausch & Lomb products: Which one is right for me? Our optician says: "SofLens Daily Disposable are a direct upgrade from the original Bausch & Lomb SofLens. ComfortMoist™ technology ensures these daily lenses keep your eyes feeling hydrated and healthy for the whole day." Our optician says: "Using revolutionary material hypergel, this high quality, bestselling daily lenses are able to mimic the surface of your eyes, providing outstanding lasting comfort all day." Our optician says: "These affordable monthly contact lenses are made from 59% water, they can be a great solution for wearers who regularly experience from dry eyes. Plus the ultra-thin lens material is specially designed to resist protein build-up, so your vision stays clear and comfortable all day." Our optician says: "Breathable monthly lenses, these can be worn for up to 16 hours a day; ideal for those with busy lifestyles who are prone to dry eyes by the end of a long day of focusing whether on work or on-the-go. You can wear these lenses for up to 30 days and even sleep in them if your prescription allows, but check with your optician first." Our optician says: "One of Bausch & Lomb’s biggest sellers, these monthly lenses provide superb value for money and comfortable, clear vision. Each box contains 3 lenses so a pack for each eye will provide 6 months of everyday wear for an affordable price." Our optician says: "Designed specifically for contact lens wearers with astigmatism, PureVision Toric last for 30 consecutive days at a time, if needed. These lenses are perfect if you need correction for long, sustained periods, lasting for 16 hours while keeping your eyes irritation-free with AerGel technology." Our optician says: "These soft monthly lenses are designed to manage astigmatism, with a flexible Alphafilcon A material that perfectly fits the eye, ensuring no irritating lens movement. SofLens Toric retain high levels of moisture throughout the day boosting comfort and are an affordable option for those with astigmatism." Our optician says: "These toric lenses are very breathable and allow more oxygen to reach the eyes than many other toric lenses. Because of this, they’re great for combatting dry eyes during long days, whilst providing consistently comfortable and clear vision." Our optician says: "PureVision Multifocal are monthly lenses designed for eyes affected by presbyopia. Comfortable and convenient, the lenses include AerGel technology, this in addition to an incredibly thin lens surface which allows oxygen to reach your eye, so they’re great if you suffer from dry eyes and want to wear lenses during long days." Our optician says: "Biotrue ONEday for Presbyopia are very high quality lenses made from hypergel, which mirrors the natural composition of your eyes for a hydrated and comfortable feel all day." 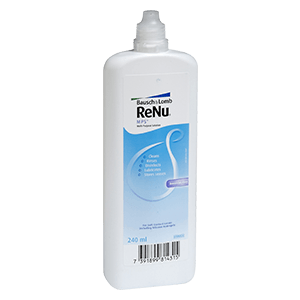 Our optician says: "ReNu Multipurpose has been used by contact lens wearers for decades, and it’s still one of the most popular lens cleaning solutions available. The gentle yet effective solution cleans away dirt and protein build-ups, keeping your lenses hygienic and comfortable, in turn preventing irritation, discomfort and eye infections." Our optician says: "Biotrue Duo Pack includes two bottles of Bausch & Lomb’s popular multi-purpose solution. It’s specially formulated to match the eye’s natural fluids, creating comfort and hydrating your eyes throughout long and busy days. The Duo Pack is especially usefully if you wear lenses daily, and would like to stock up so you are always prepared with the cleaning fluids needed to thoroughly disinfect your lenses." "I love this solution. It does a great job of cleaning the lens and doesn't cause any stinging etc that I have experienced with other solutions. I would definitely recommend!!" "Very comfortable lenses vision with them is excellent and quick delivery, well recommended." "Fantastic lens. No problems despite wearing them 12+ hours a day." "Been wearing these for years. Great lenses and cheap through this site." Bausch & Lomb is the original manufacturer of Ray-Ban Aviator sunglasses. The company developed them in 1937 to provide pilots with better vision, as they reduced lens fogging and provided high levels of sun protection. Many pilots went on to wear the glasses during WWII. 1853 - Bausch & Lomb is founded by optician John Jacob Bausch and his business partner Henry Lomb in New York and started out by making monocles for gentlemen. 1853-1900 - The company innovates a new design of glasses frame made from rubber, in response to the soaring price of horn (hence horn-rimmed glasses ) (traditionally used to make glasses frames). 1936 - Bausch & Lomb designs the Ray-Ban Aviator for WWII pilots. These super reflective sunglasses replaced flight goggles and provided better protection from the sun, reducing glare. 1971 - The company releases SofLens contact lenses, the first soft contact lenses available to the public. These revolutionary lenses provided higher comfort levels and water content than standard hard lenses. 2002 - PureVision is created, a monthly contact lens with AerGel technology for extra comfort. 2008 - ReNu MPS multipurpose contact lens solution is created, designed especially for silicone hydrogel contact lenses. 2012 - Bausch & Lomb releases Biotrue ONEday contact lenses, made from a super comfortable material called HyperGel.